Arthur Thomas Rendell, known as Thomas, was born in West Coker in 1882, the youngest of the eight children of agricultural labourer, later mason, Giles Rendell (1842-1884) and Zabiah née Hill (1843-1925). In the 1891 census Zabiah, now a widow and pauper, was living in Manor Street, West Coker, with her 23-year old daughter Julia, a domestic servant, sons Herbert and Giles, aged 15 and 12 respectively and both working as agricultural labourers, while 8-year old Thomas was at school. By 1901, still at Manor Street, Zabiah was working as a charwoman while Giles and Thomas were both working as twine makers at Gould's twine factory. In 1908, at the age of 26, Thomas married Lily Mabel Standfield (1882-1972), of Barwick, at Yeovil. They were to have two daughters, both born in Yeovil; Dorothy (b 1909) and Phyllis L (b 1916) as well as another child. In the 1911 census Thomas and Lily were living at 107 Park Street with Dorothy. Thomas gave his occupation as a labourer in a twine factory - presumably the Patent Twine Works on the corner of Brunswick Street and Hendford. They were later to move to 44 Chant's Path. Thomas enlisted at Yeovil on 15 June 1916 and joined the 7th (Service) Battalion, Somerset Light Infantry (Service No 26019). He was sent to France on 4 October 1916 at which time the 7th Battalion were fighting in the Battle of Le Transloy Ridges (1 to 18 October 1916). Coincidentally Thomas' brother Giles also fought in this battle with the 15th Battalion, Hampshire Regiment. The Battle of Le Transloy began in good weather and Le Sars was captured on 7 October. Pauses were made from 8–11 October due to rain and 13–18 October to allow time for a methodical bombardment, when it became clear that the German defence had recovered from earlier defeats. Haig consulted with the army commanders and on 17 October reduced the scope of operations by cancelling the Third Army plans and reducing the Reserve Army and Fourth Army attacks to limited operations in co-operation with the French Sixth Army. Another pause followed before operations resumed on 23 October on the northern flank of the Fourth Army, with a delay during more bad weather on the right flank of the Fourth Army and on the French Sixth Army front, until 5 November. Next day the Fourth Army ceased offensive operations except for small attacks intended to improve positions and divert German attention from attacks being made by the Reserve / Fifth Army. After the battle the 7th Battalion resumed daily life in the mud of the Somme trenches until 9 October 1916 when the Battalion left the Front Line and was billeted, first in Corbie then an the 19th to Allonville. Several moves followed until 12 December when the Somerset men relieved the 10th King's Royal Rifles in the trenches between Les Boeufs and Morval. The private diary of Colonel Troyte-Bullock (commanding 7th Somersets) records an interesting item concerning this period that was repeated in the Regimental History of the Somerset Light Infantry "Sergeant Dawson, who was always a keen patroller, went out into No Man's Land as soon as the relief was completed to have a look at the wire. He got some way into No Man's Land when he became hopelessly bogged and unable to move. He was found by a party of 5 Bosche who proceeded to pull him out. He, of course, expected to be taken off to the Hun lines, but not a bit of it. They informed him that they were his prisoners and demanded to be taken across to our trenches. Sergeant Dawson had hopelessly lost his way and said so, but they said it was quite all right as they knew the way and conducted him back to our atvanced Bn. HQs. On the way they picked up another of our men, also bogged, and took him along with them. Major Preston-Whyte (temporarily in command of the Battalion) was somewhat surprised when the sentry shouted down to say that there were five Huns coming down the stairs!" The 7th Battalion were relieved on 14 December and spent Christmas and New Year in billets in Meaulte. On 1 January 1917 the 7th Somersets (in Brigade) marched from Meaulte to Combles where the Battalion relieved the 1st Irish Guards in front-line trenches situated on the far side of the village. The first fortnight of the New Year was uneventful although the enemy's guns were "unpleasantly active". At the end of January however, Thomas was taken seriously ill with bronchitis and hospitalised at Rouen General Hospital where he died of pneumonia on 2 February 1917. He was aged 34. 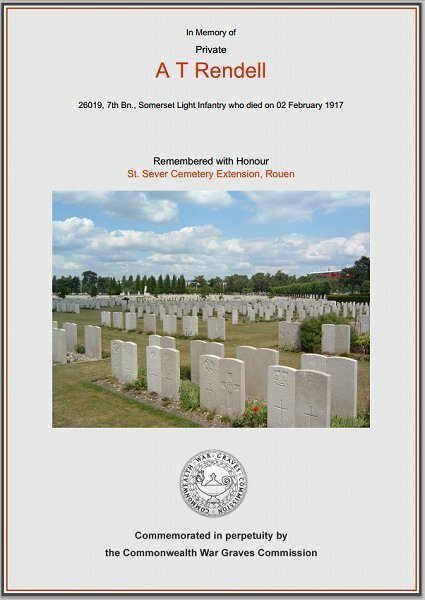 On 9 February 1917 the Western Gazette reported "A wire was received on Wednesday by Mrs AT Rendell, of 44 Chant’s Path, stating that her husband, Private Arthur Thomas Rendell, of the Somerset Light Infantry, was lying dangerously ill at Rouen General Hospital. Later another wire was received by Mrs. Rendell, stating that her husband had died on the 2nd instant from bronchitis. Private AT Rendell, who was 34 years of age, leaves a widow and three young children. He was called up on June 15th 1916, and left England for France on October 4th 1916." Thomas was interred at St Sever Cemetery Extension, Rouen, France, Grave O.IV.L.6 and his name is inscribed on the War Memorial in the Borough. Thomas' brother Giles was killed in action at Messines, Belgium, on 7 June 1917 - click here. The Commonwealth War Graves Commission certificate in memory of Thomas Rendell.